Is your dog gets the healthiest food? Are you feeding him kibble, wet or dry dog food? How do you select dog food for him? Is it on the basis of your previous experience, opinions of your friends, advice of your vet, or breeder? Is it on the basis of hundreds of TV and print media ads? Yes, we know, you are now in total confusion! So, which one you will select? This small guide will help you to select the best dry dog food for small dogs. The health of a dog depends on what he eats. Dogs require a diet that contains the right nutrients, which keep them happy, active, and healthy. However, dry foods are really convenient for dog owners. Even if you leave it for hours or days, it will not spoil. You can also store it very easily. If you keep it in a plastic jar with a tight lid, you can preserve it for even months. It will remain fresh and safe from rodents and insects. This is the most cost-effective way of feeding multiple pets. They are also available in various different sizes and types. Thus, it is very easy to find the right food for your dog. ​When you provide dry dog food to your puppies, you should make sure that it contains some essential ingredients. Superior sources of protein are the most important among them. It is essential to select a dry dog food that contains lots of animal proteins. It can be a single source meat meal or fresh meats. If the label contains simply meat, the protein quality will be substandard. ​Whole meat source must be one of the first two ingredients in a dry dog food. Meat is the most natural source of protein for dogs. It contains amino acids, which is highly important for protecting the health of canines. Vegetables, unprocessed grains, and other foods should also be included in a dry dog food. They can provide enough enzymes, vitamins, and antioxidants. ​While selecting a high-quality dry dog food, you should avoid certain ingredients. They are meat by-products, generic fat source, artificial colors, preservatives, flavors, and sweeteners. You should provide a dog food only on the basis of activity level, growth, environmental conditions, age, reproduction, illness, neutering, lactation, and some other individual factors such as coat quality, skin, temperament, etc. 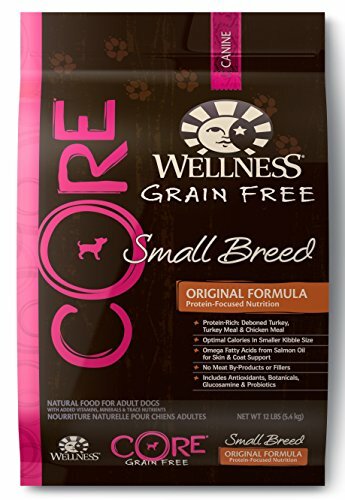 Wellness CORE Natural is a grain-free dry dog food, which is formulated specifically for non-reproducing, adult dogs. The nutritional requirements of nursing mothers, pregnant dogs, and puppies are different. Therefore, they need some special flavor formulations for maintaining their health. It is enough for meeting the everyday nutritional needs of your small breed dogs. Premium turkey and chicken are used for making this protein-rich, grain-free dog food. It contains all natural ingredients. The Wellness CORE Natural is completely free from soy, wheat, meat by-products, corn, and artificial colors, preservatives, and flavors. It is a rich source of antioxidants, probiotics, omega fatty acids, and much more. This is a nutrient dense, completely balanced dry dog food for small breed dogs. Small breed puppies have unique considerations. The metabolic rates of these puppies are extremely high. They can burn a meal in just a few hours. Therefore, you should provide them sufficient amounts of calories on a frequent basis. Otherwise, it will lead to the development of hypoglycemia, which causes muscle tremors, lethargy, seizures, weakness, and sometimes even death. Therefore, you should provide them calorie-dense food 3-4 times in a day. 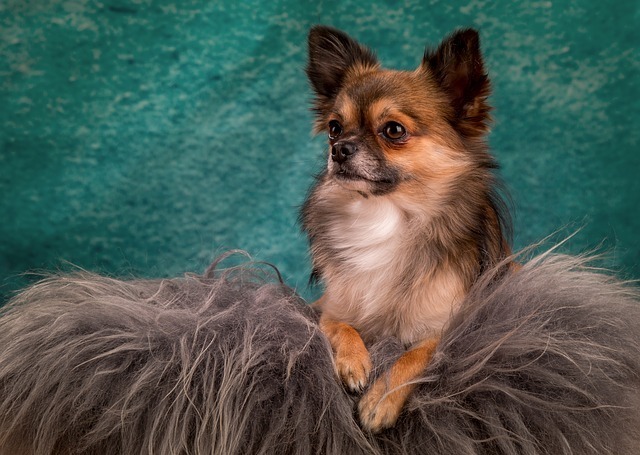 ​The Hills Science Diet Small & Toy Breed is highly useful for providing them enhanced immunity, which is essential for supporting their long life expectancy. This dry dog food is made by using only natural ingredients. It also contains lots of minerals, vitamins, and amino acids. High-quality protein such as lamb, real chicken, or salmon protein is included in this food. Thus, your dog will get the benefits of clinically proven antioxidants. 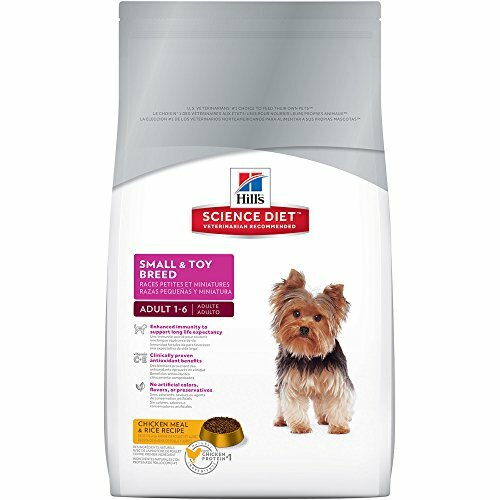 The Hills Science Diet Small & Toy Breed is completely free from artificial colors, preservatives, flavors, or chicken by-product meal. The personalities of small breed dogs are very big. However, they have some special nutritional needs. You can meet the special nutritional needs of your small breed puppy by providing him Nutro Ultra Adult Dry Dog Food. This food is made specifically for them. Therefore, they can chew it very easily. Premium ingredients are used for making this dry dog food. So, they will get an unforgettable taste when your dog eats this dog food. It comes with super-premium dog food blends, so your dog gets lots of health benefits. Sun-ripened blueberries, cranberries, pomegranate, vine-ripened tomatoes, and farm-gown carrots and spinach provide powerful antioxidants to your dog. Thus, your dog will get a strong immune system. 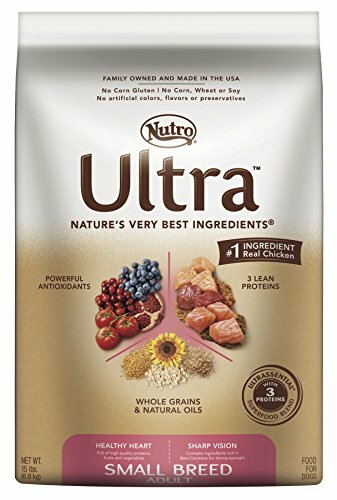 A blend of three lean animal proteins such as pasture-fed lamb, salmon, and farm-raised chicken are used for making Nutro Ultra Adult Dry Dog Food. Thus, it can maintain the overall health of your dog. 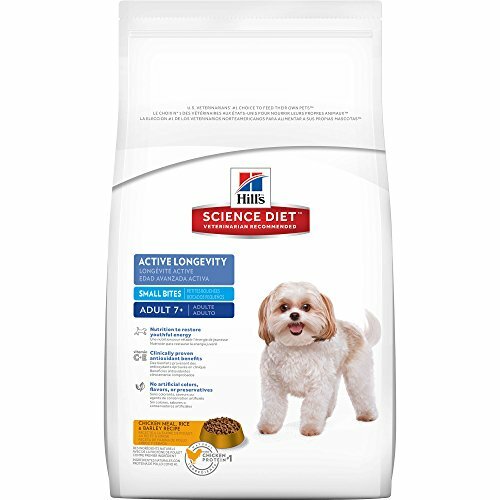 High-quality protein is used for making the Hills Science Diet Adult 7+ dry dog food. Thus, it contains real chicken, salmon or lamb as the first ingredient. The food is made by using natural ingredients, thus your dog will get clinically proven antioxidants. The Hills Science Diet Adult 7+ does not contain any artificial colors, preservatives, or flavors. It is also free from chicken by-products. This dog food can provide enough nutrition to your dog, which is helpful for restoring youthful energy. The Hills Science Diet Adult 7+ is a rich source of chondroitin and glucosamine, which are beneficial for achieving healthy cartilage and joints. The nutritional requirements of small breed dogs are different from their larger counterparts. Though the size is small, the small and Toy breed dogs require more calories than larger dogs. The metabolic rates of these dogs are also very high. Dogs require various different vitamins, minerals, and nutrients. A complete and balanced diet is essential for proper growth and development of dogs. The products mentioned above are the best dry dog food for small dogs. You can purchase any one from this list.